I started experiencing lower back pain and stiffness from the age of seven. I tried many types of treatments but none seemed to give me any relief. When I was twelve years old an Orthopaedic consultant advised me to “learn to live with it” and that in the future I would have to undergo hip surgery. At 13, my family moved to the United States where my parents first heard about chiropractic treatment,  We decided to investigate the matter and after the first treatment, my back pain disappeared. It was immediately following this treatment that I decided that I would become a chiropractor. In 2002 I graduated from the Anglo- European College of Chiropractic (AECC) in Bournemouth with an MSc in Chiropractic Sciences. For 10 years I have run clinics that treat all types of pain: headaches, back pain, neck pain .. and more. Over the years, the feeling grew in me that there was additional knowledge that would help to improve the accuracy of diagnosis and long- term effectiveness of care. After investigating the matter, I was exposed to Functional Neurology. Functional Neurology gives me a much deeper understanding of the functioning of the nervous system with particular emphasis on the control of posture, balance, coordination and movement. This enables me to clearly identify the root of the problem and customise a care plan that is tailored to each patient. This provides optimum results and this is the method that I have been utilising since 2012. Whether you want to get rid of your pain, prevent future problems or improve athletic performance, With my experience and knowledge I would love to help you to achieve your health goals. 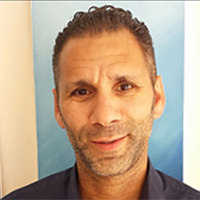 Eastbourne Chiropractor Mark Yacoub is registered with the General Chiropractic Council and is a member of the United Chiropractic Association.